Most health experts and specialists today dish out solutions that won’t work. Prescriptions. Fad Diets. Supplements. Fasts. Excess Cardio. Not only that, they make us MORE sick. They may work to feel better for a month or so, but not for good, because they’re missing the mark on what’s making you sick and tired in the first place. There is a HUGE difference between feeling better for a moment vs feeling better for a lifetime. Because I teach you how to get to the ROOT CAUSE of your hormonal and metabolic chaos, and how to fix it FAST, you’ll feel unstoppable again. Sometimes our bodies and minds feel hijacked. Where is that vital self that could pull all nighters, go on a binger, and still get up and exercise in the morning before work? Where is the girl who loves to dance when no one is watching and sing songs on the radio? Do you ever feel that loss of who you were, your vitality and zest for life? I did for a long time and it turns out my long journey has really been a path to learn how to help others. My torture is my teacher. I am grateful. In all these years with debilitating gut problems that led to foggy brain, missing work, missing words, increasing aches and pains, and zero energy, I still held out hope that I could heal. I just hadn't turned over every rock yet. I went deep into many rabbit holes and learned the devil's NOT always in the details. It can point you in the right direction, but your body is not just a bunch of separate parts. Your body works as a whole. It's so smart. If your body views a threat, it stops working on digestion and channels all the energy to the limbs to run away. Our bodies will continue to weaken and lose function before giving up. Many of these weaknesses show up as symptoms. We lose a lot of function before symptoms even show up. What do we do then? This is when we typically go to the doctor. The doctor may prescribe a pill or procedure or in my case tell me, "your weight's good, you look great, just be happy." When it comes to chronic disEASE, the traditional insurance based health care system is broken. That system failed me and many others with chronic conditions leaving us with the aftermath of expensive, invasive procedures and often dangerous drugs. It left me to figure out on my own how to find the root cause of what was putting me in slow motion decay. Going from practitioner to practitioner and I tried them all. I was told all kinds of things, "you have a complicated case," or "have you tried antidepressants?" It was a wheel of trial and error based on what symptoms were surfacing at the moment. It was time consuming and expensive with no results. A targeted functional approach that included detoxification and a change in my attitude. My attitude? Yes. True healing required me to ditch my ego. I wanted a quick fix. I was sick and tired of being sick and tired. It took a long time for the dysfunction in my body to appear. I came to terms with the fact that it was going to take a while to detoxify my body and restore function. What is a targeted functional approach? A functional approach means that you look at the body as a whole. Skin problems are a great example. What does it mean when you break out in a rash? Go to the dermatologist and they will certainly prescribe a cream. It helps the itch, but the rash returns. What's going on here? Your skin is reflexive of what's going on inside your body. It's a symptom and an early warning system. A functional approach aims to get to the underlying cause. Internal or external stressors may be triggering inflammation and manifesting through your skin. A targeted functional approach is what is taught in Functional Diagnostic Nutrition. We are super health detectives. We run functional labs typically not offered by your doctor to uncover hidden stressors. We combine this with lifestyle coaching to find the best Diet, Rest, Exercise, Stress Reduction, and Supplementation (DRESS) for you. 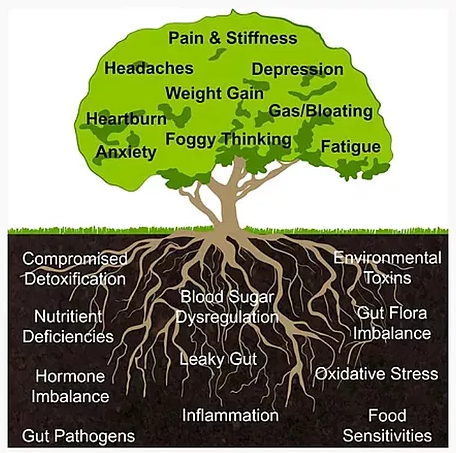 This approach has been proven over and over again to rebuild health based on what is good for your bioindividuality, not what has the latest marketing "healthy" label. I can help you get the body you want with the energy you desire so you can live the life you deserve. If you or someone you know is committed to solving their major health complaints, please consider working with me. I am a FDN-Practitioner ready to partner with you on your journey back to freedom.